Wet n Wild MegaGlo Cheek & Lip Tint is a new, limited edition cream blush and lip tint that launched with the Wet n Wild Queen of my Heart Spring 2017 Collection. Some of you might recall the Wet n Wild Megaglo Multi-Stick that launched for Summer 2016 for a limited time and for me the Wet n Wild MegaGlo Cheek & Lip Tint are sort of a new formulation on that stick. Wet n Wild MegaGlo Cheek & Lip Tint ($3.99 at Harmons) are available in three shades each of which comes housed in a twist up chubby stick that’s 0.26 oz in size. The packaging is cute with a lace heart decorating the front however, it confuses me to no end why brands insist on creating products that don’t swivel down completely. You have to be careful not to slice off a chunk of the blush when replacing the cap because it does not swivel all the way down. These are formulated for use on your cheeks as well as your lips but I personally dislikes the formula on my lips as the creamy texture seems to sink into my natural lip lines and looks patchy. So, I stuck to using them as a blush versus a lip tint. Perhaps with a little clear gloss they might look better but I also dislike applying on my lips and proceeding to follow up with use on my face. It sort of grosses me out so as a blush it seemed better suited for me. The texture is light, creamy, and slightly tacky and blends easily enough on my drier cheeks without adhering to drier areas. It feels a bit tacky but nothing uncomfortable and in some ways the texture reminded me a lot of Bobbi Brown’s Pot Rouge but with a less thicker consistency. The color can be applied sheer but it builds very easily for more pop and there’s no lack of pigmentation here should you wish for more color. I had no trouble blending the color and it looked very natural and pretty. It does have a dewier look and finish but the “megaglo” isn’t quite there as there’s no shimmer or luminosity in the completed look. The wear time was a bit shorter for me and faded at around five hours but this isn’t surprising as my skin seems to eat up cream blushes of all kinds. 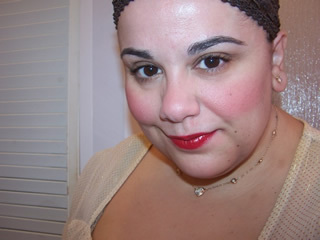 As Spring nears you might want to sport a dewy blushing look for the warmer weather. This is a nice, inexpensive way to get that look. Wet n Wild MegaGlo Cheek & Lip Tint is launching now at drugstores or you can buy the entire Wet n Wild Queen of my Heart Collection for $29.99 at wetnwildbeauty.com. I got these and also my cheeks seem to swallow creamed blushes but I do like them since it is easy to blend.